I must admit, I love Velolove – fine tees that fit great and feel good. And their designs are very typographical – that’ll get me every time! 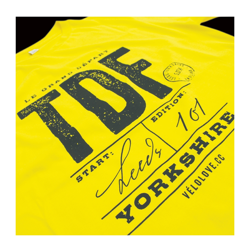 Their 2014 Tour de France Grand Depart and King of the Mountains tees are cases in point. After last year’s Tour de France heartbreak, where he didn’t make the time cut by a hair’s breadth in the TTT stage, Ted King is coming back to the Tour this year. And here’s a fun little film about it, courtesy of Cannondale.